It’s Spring time and baby fever is very contagious. Because we are new to homesteading and goat breeding standards have changed since I had goats as a child, I was not aware that goats should be tested for several standard tests before you purchase them. The two Mini Nubians we had purchased were tested by our vet, but we did not receive their clean test results back before the Nubian breeding season ended. So, we were disappointed to not have any baby goats born on our farm. We had been so excited about having goat babies. When I shared with our family how much fun it was for me to bottle feed our baby goats growing up, they had so many questions. They had seen our puppies and kittens getting nourishment from their mama. Naturally, the questions came as to why we are bottle feeding our baby goat. All of our disappointment grew as we realized it could be another year before I could share the bottle feeding experience with them. Alas, Craigslist and all of it’s tidings of newborn farm animals. We knew that we wanted to increase our herd and also knew that we wanted to purchase a Nigerian Dwarf goat. I saw an ad for a registered Nigerian Dwarf from a reputable farm. She was just two days old and adorable in every way, with blue eyes. We went to see her and decided, on the spot, that she was ours. It is always good to have a newborn baby get colostrum and nourishment from their mama. We left her to be cared for by her goat mama for the next week, with the understanding from the sellers that they wanted her to be picked up as a bottle baby the next week. 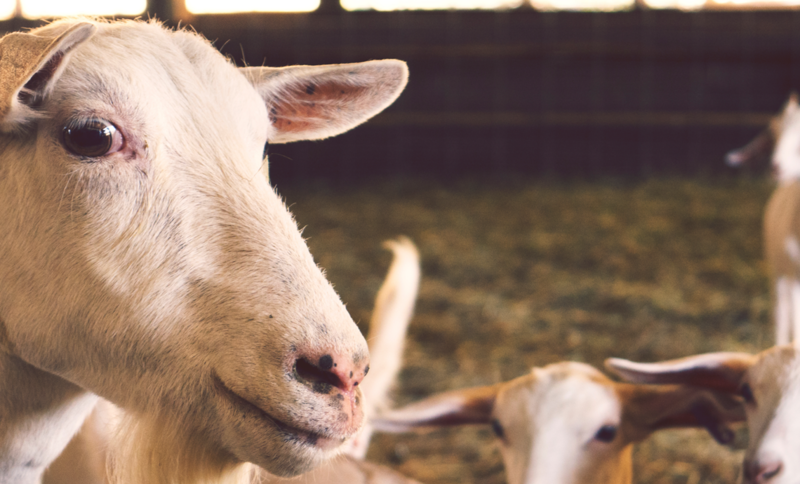 There are many different thoughts on how to raise goats. The farm we purchased her from had their own experiences and believed that bottle fed goats are more friendly. This is why we are bottle feeding our goat. Growing up, we had goats. We would have babies and mama together for the first month. After that, we would milk mama and bottle feed babies. This situation was not really much different; especially because we would be getting the milk from the farm we were buying baby from. I had not set out to buy a baby we would need to bottle feed, but I am happy that we made this decision. We named our sweet baby girl Willow Love. We brought her home at one week old. We kept her in a large dog crate with a bed of straw. She stayed in that crate in our sunroom because I wanted to make sure we kept her on a proper bottle feeding schedule and to make sure she was okay. I am not embarrassed to share that she spent some time in our house. After all, there is nothing cuter than a baby goat and our family has seriously “gone country.” She needed to be fed three bottles a day for the first month, and we gave her hay and oats as well. Now, Willow is five weeks old. She was slowly introduced to our other goats, Liberty Belle and Ginger. She began to spend a few hours with them and then all day, and now she is comfortable with her new herd all night as well. Willow drinks two larger bottles per day now and will go down to one bottle a month in her third month. Bottle feeding has so many positives. One of the biggest perks and another reason why we decided to bottle feed our goat – it will be much easier to wean her off of milk and she is now super friendly with humans. We never planned for our goat to jump int0 our laps if we are out sitting in the yard, but Willow is very taken with my husband. He, definitely, is her person. At this point, our farm is small so our family does all of the caring for our gardens and animal care. It’s a commitment for sure. A couple of Saturdays ago, our grandson Finn had his first birthday party. We also had to keep Willow on her feeding schedule. We ended up bringing Willow with us to Finn’s party and she became the honorary, special guest! Finn’s party was such a success because who doesn’t love the cutest baby ever turning one?!?! We were happy that Willow made it more special for Finn and the guests who attended. Next Spring, we anticipate both of our other goats having kids of their own. I am still not sure how exactly we will deal with the timing of bottle feeding, but I know that at some point we will wean them from their mama and onto the bottle. All I know right now is that we have enjoyed this experience with Willow. I am grateful that she is healthy and well acclimated to our family and farm. She has been welcomed into her new herd so we must be doing something right.